By now, you will have heard the argument that sitting all day is bad for your health and overall wellbeing. So many of us work office-based jobs which require us to spend long and consistent hours in front of a computer screen. 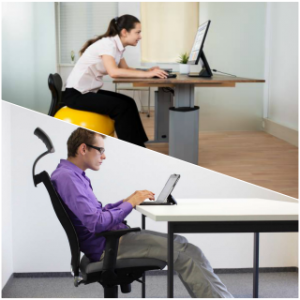 Experts are saying that there are significant health risks associated with these prolonged periods of sitting. Dr James Levine, Director of the Mayo Clinic at Arizona State University, coined the now common phrase ‘sitting is the new smoking’. Levine’s research has found that sitting at a desk for five or more hours in a day is the health equivalent of smoking a pack and a quarter of cigarettes in terms of the expected reduction in life expectancy. These revelations are profoundly worrying given that the average person spends 12 hours a day sitting. The American Heart Association actively encourages people to ‘sit less, move more’. This is, of course, a good start, but unfortunately, there is more to it than simply introducing more movement into our daily routines. Even those who find themselves doing regular, intense physical exercise are not absolved of the risks associated with prolonged periods of sitting. Physical inactivity is now the fourth leading risk factor for global mortality, responsible for 2.3 a staggering million deaths a year. One of the more obvious effects of sedentary sitting is that of weight gain. A lack of movement can slow down the metabolism and diminish the ability of muscles to break down fats. Sitting down has been found to burn 21% fewer calories than standing up. It is no wonder, then, that those who move more regularly are significantly less susceptible to obesity than those who don’t. The vast majority of those who find themselves sitting for long periods of time will do so with less than perfect posture. It takes the average person only three minutes of sitting before they fall into a slumped posture. The all-too-common spinal curve perpetuated by sitting in front of a screen for hours can lead to an unnatural head position and hence a strained neck. Many also experience soreness in the shoulders and back due to the over extension of shoulder and back muscles, and the overworking of spinal ligaments. Movement allows the soft disks between vertebrae to expand and contract and soak in fresh blood and nutrients like sponges. A lack of regular movement can lead to an inflexibility of the spine, where disks are squashed unevenly and collagen begins to harden around tendons and ligaments. The contraction of the psoas muscles created by extended sitting can also lead to herniated lumbar disks. There is also a substantial risk posed to the internal organs through this kind of sitting. Those who sit for long periods have a greater risk of developing heart disease. A lack of movement means that muscles burn less fat and blood flows more slowly through the body, allowing fatty acids to more easily cause blockages in the heart. Extended seated periods have also been linked to high blood pressure and elevated cholesterol. Sedentary individuals are around twice as likely to develop heart disease as their moving counterparts. Sitting all day in a curved spinal position can also create lung compression and limit the capacity of the lungs, meaning that the body has less access to vital oxygen. This, combined with the reduced speed of blood being pumped around the body means that much less oxygen than is required is sent to the brain or to other parts of the body. Another potential health problem is an overactive pancreas. The pancreas is the organ responsible for producing the hormone insulin. Insulin carries glucose to the cells to provide energy. Since cells in inactive muscles don’t respond as effectively to insulin, the pacreas produces increasing amounts. These changes – which can start to take place after only one day of prolonged seated activity – can lead to diabetes and other diseases. A series of studies have shown prolonged periods of sitting to be a risk factor in the development of colon, breast and endometrial cancers. Although the reason is, as yet unclear, the evidence shows a clear correlation between sedentary sitting and these types of cancers. As you might expect, long periods sat down and not using many of the body’s larger muscles can cause muscular issues. Abdominal muscles go unused when the body is slumped into a chair, causing them to go mushy. Hip flexors can become very tight because they are rarely extended. Glute muscles can become limp due to underuse. All of these can lead to a number of postural issues and easily become very painful. The Poor circulation of blood around the body can cause fluid to pool in the legs. This can lead to a variety of issues from swollen ankles and varicose veins to potentially fatal blood clots and deep vein thrombosis (DVT). Bones are strengthened through weight-bearing activities such as walking and running. Those spending long hours seated can find their bones becoming softer, and may find that osteoporosis develops as a result. It is not just the body that will deteriorate as a result of long seated periods. The effects on the brain are also significant. Prolonged periods of sitting mean that few of our muscles are active, this slows blood flow and noticeably reduces the release of productivity and mood-enhancing chemicals such as endorphin, oxytocin, serotonin, and dopamine to the brain. This increased blood flow to the brain has repeatedly been shown in studies such as this one to improve concentration, productivity and engagement. The long-term impact of this can be huge, as increased movement dramatically increases the number of new brain cells created over time. Experts have documented the link between both high and low glucose levels in the brain and the onset of dementia. Extended periods of sitting are commonly associated with low glucose levels in the brain. Studies have shown that low-intensity exercise such as walking after a meal can dramatically reduce both spikes and drops in glucose levels when compared to sitting after a meal. Gym bunnies should be aware, however, that whilst intense exercise may be good for your fitness levels, it will do little to reduce your susceptibility to any of the aforementioned ailments. Studies like this one have found that it does not matter if you are training for a marathon after work, you are almost as likely as your sedentary counterparts to experience many of these health complications if you are not incorporating regular movement consistently as an integral part of your work day. All that sounds pretty serious, but you will be pleased to know that there are simple ways that you can mitigate those risks. The good news is that now you know better, you have the tools to do better. Experts recommend that you break up prolonged periods of sitting by standing up, moving and contracting muscles, even if it is only for a minute or two. What is the best form of exercise to do? It actually doesn’t matter – the human body just wants to be moving regularly. We hear a lot of talk about people changing to using standing desks as a way to overcome this long – and frankly quite terrifying – list of possible health complications from sitting all day. Is it necessary to switch to a standing desk? The simple answer is no. You do not need to be standing, you just need to not be sitting for long stretches of time. Expert recommendations include incorporating small routine changes into your day such as getting up to make a cup of tea, taking phone calls standing up, holding walking meetings, taking the stairs instead of the lift and sitting on something wobbly like an exercise ball. There are also plenty of chair options on the market that encourage good posture and the correct engagement of the abdominal muscles. Many of these changes are small ones, but to make the shift to a more active work-style will take a good degree of commitment. We, here at MyHealthyFamily, believe that hose who are able to make a sustainable shift towards regular movement throughout their day will inevitably find themselves rewarded with a better health prognosis than those who do not make the shift.